Taking and testing a soil sample is the best way to accurately determine the fertility of your soil. A soil test will tell you what (if any) nutrients are lacking or if there are any soil imbalances which need to be corrected. Balanced soil will grow the healthiest, most flavorful and nutritious vegetables possible. The goal in taking a sample is to get an average, representative sample of the garden as a whole, to a depth of about 6 inches, which is the zone with the most root growth. To take a soil sample, start by picking several different spots around your garden from which to take equal-sized samples. Choose representative spots, such as where you grew broccoli, where you grew tomatoes, where you grew carrots, etc. Avoid any particularly weird places, like near cement fenceposts, downspouts, where the cat poops or the dog pees, perennially soggy places, etc. You don’t want anything out-of-the-ordinary to skew your test results. Remove any mulch or other organic matter from the surface. Use a stainless steel tool if you have one; if not, make sure your old shovel is clean of any rust or other contaminants that may affect results. 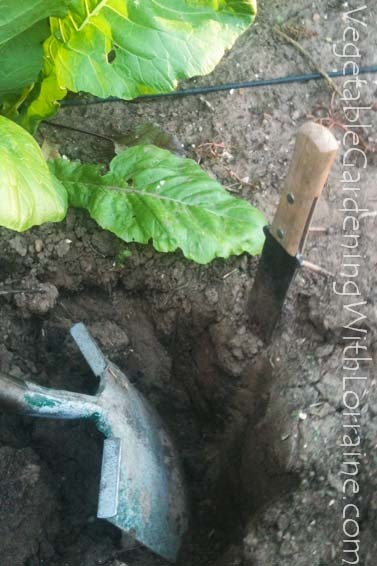 The way I take a soil sample is to stick my garden spade in up to the hilt, and then tilt it forward, leaving a space behind. This gives me a sort of “clean cut” from which to take a soil sample of the whole 6” depth without the top caving in, inaccurately giving me more upper soil than lower soil. Try to sample evenly from the whole 6” depth. Use a clean stainless steel bowl or other container (that has no residues of any kind in it) to put your samples in. When you’re done sampling, mix them all together as evenly as you can, breaking up any chunks, removing stones, every bit of visible organic matter you find (leaves, twigs, root bits, etc.) and any earthworms or other visible critters. Once your mix is very even and clean, you can let it air dry a bit to make it lighter and cheaper to ship, but from the lab’s perspective, the water content doesn’t matter. But do not bake it in an attempt to dry it faster. A home soil test kit only measures the three major macronutrients in the soil: nitrogen, phosphorus, and potassium, the "N-P-K" of fertilizer-bag fame. But plants need 56 different elements on a daily basis to accomplish their basic metabolic functions! No soil test is going to measure ALL of these, but for healthy soil balancing you're going to need a bigger picture than only 3 of these 56. Our soils have become largely depleted of needed minerals in the last 50 years, and if we're growing our own food, we might as well make it healthier food than what we get at the store. Nitrogen, potassium and phosphorus readings don't tell the whole story, because they interact with with other minerals. Unless the secondary nutrients, particularly calcium and magnesium, are present in the right ratio, the potassium and phosphorus may not be absorbable by the plants, even if they are present! For this reason it is important to measure these too, as well as the micronutrients. While micronutrients are needed by plants only in relatively small amounts, those tiny amounts are critically important for plant health. I highly recommend sending your soil sample out to a professional lab. It's about the same price, and will give you a lot more information, which you can use to fine-tune an organic fertilizer prescription. 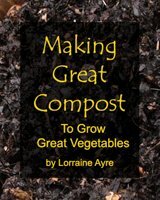 This will help you grow the healthiest and most nutritious vegetables you can get anywhere. The science behind translating soil test results into a fertilizer prescription is not simple, because you have to figure out how much of what to add to create certain ratios of minerals, while keeping each within certain limits. The easy way to obtain a custom fertilizer prescription using your soil test results is through an online calculator program that you can use as many times as you want in a year for $9.50. Details are in the organic fertilizer article. Now before you mail it off to the lab, you need to know whether you have a soil that is extra high in calcium, known as a “calcareous” soil. To figure this out, do a vinegar fizz test. Take about an ounce of soil and put it in a little bowl, and pour about a tablespoon of vinegar on it. Put your ear up close to it, and watch and listen to see if it fizzes at all. If it does, you have a calcareous soil. and ask for both an S3 Standard Soil Test and an Ammonium Acetate extraction test. As of Dec 2013, together they cost less than $20. When you get your soil test results back you will be using some numbers from one of the tests, and some from the other test. You need both because the high pH of calcareous soils will cause inaccurate reporting of certain mineral nutrients on the standard soil test. The AA extraction gives more accurate results for those minerals. and ask for the Standard Soil Test, which costs about $20.. When you get your results back, visit the organic fertilizer article (linked above) to learn how to use the numbers on your soil test report to bring your garden back to maximum health and get your soil fertility as high as possible.